In the 10 days after the 2016 election, nearly 900 hate incidents were reported to the Southern Poverty Law Center, averaging out to 90 per day. By comparison, about 36,000 hate crimes were reported to the FBI from 2010 through 2015 — an average of 16 per day. The numbers we have are tricky; the data is limited by how it’s collected and can’t definitively tell us whether there were more hate incidents in the days after the election than is typical. What we can do, however, is look for trends within the numbers, such as how hate crimes vary by state, as well as what factors within those states might be tied to hate crime rates. An analysis of FBI and Southern Poverty Law Center data revealed one factor that stood out as a predictor of hate crimes and hate incidents in a given state: income inequality. States with more inequality were more likely to have higher rates of hate incidents per capita. This was true both before and after the election, and the connection held even after we controlled for other relevant variables. The federal government doesn’t track hate crimes systematically (agencies report to the FBI voluntarily), and the Southern Poverty Law Center uses media accounts and people’s self-reports to assess the situation. Moreover, FBI hate crimes data for 2016 won’t be released for another several months, and the Southern Poverty Law Center didn’t collect data before the 2016 election. However, both data sources are publicly available and easy to navigate, which means they’re some of the best we have. But they also have biases baked in. The FBI Uniform Crime Reporting Program collects hate crime data from law enforcement agencies. But because the data is submitted voluntarily, it’s unclear how comprehensive the data set is. We don’t have data from Hawaii, for instance. Moreover, the UCR Program collects data on only prosecutable hate crimes, which make up a fraction of hate incidents (which includes non-prosecutable offenses, such as circulation of white nationalist recruitment materials on college campuses). On the other hand, the Southern Poverty Law Center data — which comes from a combination of curated media accounts and self-reported form entries — includes both hate crimes and non-prosecutable hate incidents. Moreover, heightened news coverage of hate incidents after the election may have encouraged people to report incidents that they would not have otherwise reported. This is called awareness bias — a trend that is well-established in epidemiology, environmental health and other fields of research that frequently use self-reported data. 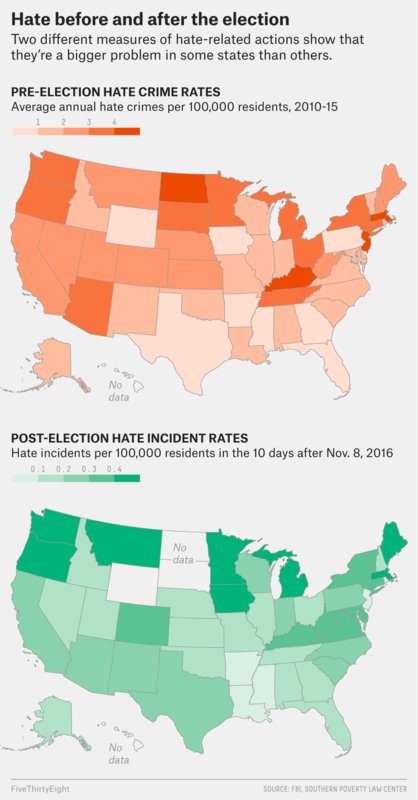 Despite these limitations, both data sets reveal that hate incidents aren’t uniformly distributed across the United States. In other words, a greater number of hate incidents were reported in some states (per 100,000 people) than in others — both according to the SPLC after the election and the FBI before it. So why do some states see so many more reported hate incidents than others? After controlling for these variables, we found that income inequality was the most significant determinant of population-adjusted hate crimes and hate incidents across the United States — for both pre-election and post-election data sets. Income inequality is a known determinant for neighborhood violence and violence in general, of which hate incidents may be considered a special subset. In an economy that increasingly demands a college degree, high-school-educated individuals aren’t able to earn as much as their college-educated neighbors. This — combined with misplaced blame on targeted minority groups — may provide sufficient motivation for hate incidents against them. Our analysis has limitations, however. Although we controlled for many potential confounders, correlation between income inequality and hate crimes or hate incidents doesn’t necessarily imply causation. Socioeconomic drivers for hate incidents at the community level may differ from the state-level indicators that we identified here. Moreover, it is likely that neither data set is truly representative of hate incidents across the United States, and it’s possible that whether people report or don’t report these incidents is different among states. That could mean that states with law enforcement agencies and residents that are more likely to report hate crimes and hate incidents are overrepresented in the FBI and SPLC data sets, while those that are less likely to report are underrepresented. Nevertheless, the fact that both data sets yielded similar results suggests that the findings are robust, and future work using additional data sources may provide further insight into determinants for both pre-election and post-election hate incidents in the United States. Promising options include annual National Crime Victimization Survey data from the Bureau of Justice Statistics and post-election hate incident data from Ushahidi, a crowdsourcing platform designed for data collection during times of crisis, which could supplement the FBI and SPLC data sets. “A key difference is that the FBI data are based on police records or crimes known to and recorded by the police, while the [National Crime Victimization Survey] is a self-report survey asking respondents about crimes that are both reported and not reported to the police,” said Lynn Langton, chief of victimization statistics at the Bureau of Justice Statistics. Because a majority of hate crimes go unreported to law enforcement, the survey “casts a broader net,” she said. Meanwhile, Ushahidi’s Document Hate project — working with ProPublica and other collaborators — aims to make it easier for people to report hate incidents. By allowing users to self-report via Twitter, text message and email, in addition to the more traditional form entry approach used by SPLC, Document Hate “meets people where they already are,” Ushahidi Chief Operating Officer Nat Manning said. Moreover, unlike the SPLC data — which documents only the first 10 days after the election — Ushahidi plans to continue collecting hate incident data. That’s particularly useful because some groups expect there to be hate incidents in the wake oftied to Inauguration Day, as well. The role that the Trump presidency may play in the future of hate incidents in the United States remains uncertain. While it is unclear whether hate incidents truly increased after the election, our preliminary analysis suggests that the same factors that were linked to hate incidents before the election were also linked to them afterward. In the United States, income inequality likely serves as a catalyzing condition for hate incidents, and — if economic disparity increases under Trump’s administration, as some economists expect — this new era may serve to enable them. CORRECTION (Jan. 24, 7 p.m.): A previous version of this article mischaracterized the data used in the analysis. The analysis included eight days’ worth of post-election data, not 10. The article has been updated with the data from all 10 days. Also, the previous version said that a 1 percent increase in Gini index and a 1 percent increase in population with a high school degree were associated with more hate crimes; both should have said 1 percentage point. We used existing literature on factors tied to neighborhood violence to help inform our variable choices. Because state-level socioeconomic factors didn’t vary considerably over the years studied (2010 to 2015 for the FBI hate crime data and 2016 for the SPLC hate incident data), the same input data was used for both versions of the model. UCR Program catchment populations — the fraction of the total statewide population that is covered by participating law enforcement agencies — and 2010 Census data for state populations were used to adjust the FBI and SPLC data to crimes and incidents per 100,000 people, respectively. Backward-stepwise elimination — in which variables that aren’t significantly correlated with hate crimes or hate incidents are removed from the model one at a time until only significant determinants are left — was conducted to trim the model outputs. A 1 percentage point increase in population with a high school degree was associated with 0.31 more hate crimes per 100,000 people per year (on average from 2010 to 2015) and 0.05 more hate incidents per 100,000 people in the 10 days after the election. A 1 percentage point increase in Gini index was associated with 0.64 more hate crimes per 100,000 people per year (on average from 2010 to 2015) and 0.09 more hate incidents per 100,000 people in the 10 days after the election. A Gini index of 0 percent signifies complete income equality, where each person has the same income as the next. Differential effect size may be attributable to differences in population-adjustment methods used for the FBI and SPLC data; the UCR Program catchment population in a given state comprises a fraction of the total population for said state.